I’ve always felt that no accessory can complete your outfit like the perfect handbag. The bag you decide to carry can say a lot about your style and personality. While I deeply appreciate luxury designer handbags, the world of mid-range designer bags has a wide range of really nice designs for a good price. For almost anyone, a thousand dollars is a lot of money. I know you’re probably on a budget, or at least don’t want to spend a ton of money on a handbag. I get it. You’re likely a normal shopper, who lives a normal life with a normal job. That said, you like to treat yourself to something nice; and that might be a handbag. Handbags carry all the things we need in our lives while making a style statement. When I’m shopping for a bag, I think “am I going to wear this in five or ten years?” I want my pieces to be investments, but also stylish and somewhat affordable. The under-the-radar or up-and-coming brands you may have never heard of, but need know about. Part rustic, part luxury, Ampersand As Apostrophe uses form and function to create clean, minimalist accessories in custom-designed colors like neon yellow, camo, and a super dreamy space metallic. Because each piece is crafted using American leather hides and custom-designed colors, pricing for items vary based on leather and size, ranging from $51 to $1,078. Their signature design is the Sideways Tote or the Half Tote. With a motto like “fewer, better things”, you’re definitely going to find something of high quality from this San Francisco-based designer brand, especially if you’re into classic, minimal design. I own their original tote in pebbled leather, which has been traveling all over the place with me for years and still holds up. Plus, they offer free a Monogram when you buy a bag (mine has my nickname on it). Known for their Bucket Bags and minimal leather luxury aesthetic, the New York-based brand was started in 2012 by two badass ladies, Rachel Mansur and Floriana Gavriel. High quality, Italian-made products focus on material, color, and detail, to create an American brand that got the attention of luxury handbag lovers when their Bucket bags flew off the shelves in 2012. Mackage coats officially debuted in 1999 and continues to release covetable modern warm winter jackets and accessories—from leather handbags, cashmere scarves, and kidskin gloves. Today, Mackage is known for leather touches on their coats and jackets. Their handbags use their same luxurious leather and design sense to create versatile bags that can be dressed up or down, featuring bold, graphic hardware (think repeat chevrons and arrows). A.P.C. is a French ready-to-wear brand founded in 1987 by the Tunisian Jewish fashion designer Jean Touitou in Paris. A.P.C.stands for Atelier de Production et de Création. With a timeless and clean-lined aesthetic, A.P.C. has a certain kind of Parisian cool that few brands can accomplish. Their handbags have a vintage-yet-modern laidback vibe in luxe leather with sleek everyday style. Loved by our girl Meghan Markle, this Edinburgh-based luxury label is a new kid on the block, founded in 2013. Handcrafted in Spain, it takes up to 20 hours to create a Strathberry bag. With clean, modern design and a distinctive bar closure, this brand is about to blow up, and you’ve heard it here first. 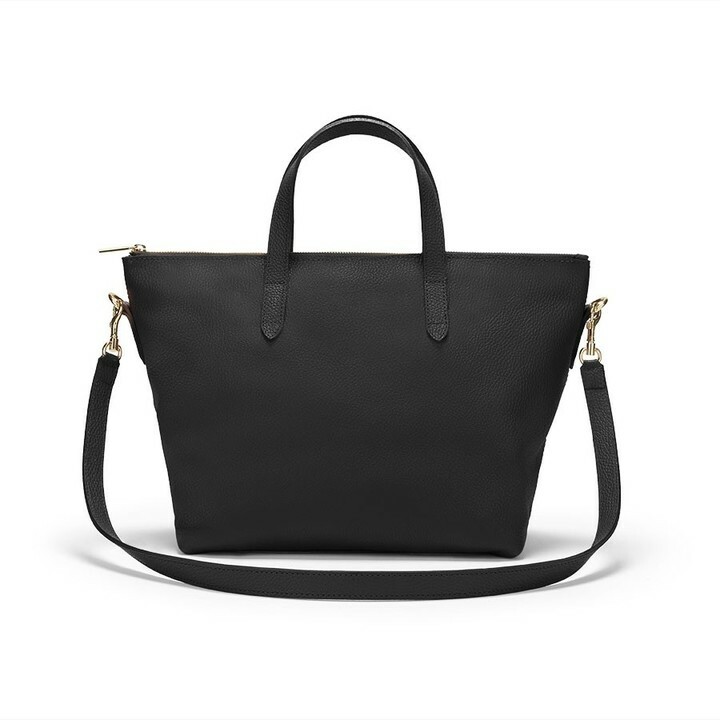 The signature Strathberry tote price ranges from about $400-$700. Undeniably feminine with its sensual curves, the “Number One” is Polène’s signature handbag. All Polene bags are made in Ubrique, Spain, a city which has specialized in high-end leather goods for more than a century. Their studios combine craftsmanship and high-tech equipment to make each bag entirely by hand. The “Numéro Un” looks like the ideal size day bag (not too heavy), made of all leather, and a completely swoon-worthy shape. Their signature bag costs bout $400, making it a pretty affordable day bag in this category. Senreve is a relatively new brand; their website reads “inspired by the women who do it all, Senreve stands for beauty and versatility coexisting—without sacrifice,” and I’m into that. I’ve been seeing their bags on forums and on Instagram for a little while now, but have never been very into this silhouette for myself. That said, after I’ve done a little more research, I really like this bag as an every day bag for lugging around everything with you. Senreve’s signature bag, the Maestra, is crafted from water-resistant Italian leather and convertible straps so you can carry it as a satchel, crossbody or backpack. Senreve’s signature bags clock in at $795 (Maestra) and $695 (Mini Maestra). I love this brand. Their clothes are cool, edgy, and refined. AllSaints is known its cool-girl vibe using a variety of luxurious textures and materials like leather, cashmere, and silk. But they also make killer accessories. The Kita bag (below) clocks in at $298, making it one of the more affordable bags on this list, and it’s beautiful. With both a shoulder strap and a crossbody strap, this bag looks functional and high quality for a price that won’t set you back too much. Its off-kilter reversed seams look subtly deconstructed to add a little more style than just a basic black leather bag. I imagine this bag smells really, really nice (if you’re into that kind of thing). The Zep style is also really, really cute. A source close to the company tells me that their handbags are made in that same manufacturing facilities as Prada and Givenchy to provide consumers with the same quality bags for way less money. Inspired by her Korean heritage, Kacy Yom’s collection has Pacific Northwest innovation combined with the soul of a legendary fashion brand. This Seattle-based designer has created a beautiful collection of multi-functional handbags featuring Italian pebbled leather, smooth leather trim and bright palladium hardware. These bags FEEL expensive (you know what I mean). Kacy Yom’s debut collection, named Soh-Lee, is rooted in traditional Korean design with bright colors and simple lines, ranging in price from $650 to $1100. The Cho-Rang crossbody bag (pictured below) is my favorite from this line, and I look forward to seeing more from this talented designer. I’d be remiss if I didn’t mention some of the more well-known global brands that have been releasing popular handbags for years. These aren’t luxury designer bags, but I’ve owned or lusted after these bags from brands, which makes me believe that I think you would too. These brands are a little more “basic” and are more recognizable to every day people. Plus, they are easier to find in stores. I won’t mention where to buy these, because most of them are available at the usual department stores and online (and they go on sale!). While I wouldn’t exactly consider Madewell luxury handbags, but I think this list is incomplete without a mention of this brand. Prized for their high quality in an affordable price range, you can buy a workhorse Transport tote for a price under $200 that will go with you everywhere for years. My first designer handbag was Marc Jacobs, and I’ve been a fan of MJ bags since the early 2000s. Marc Jacobs was Creative Director of Louis Vuitton from 1997 to 2014 (a pivotal time in our lives). Since he left LV, he’s been reassessing the direction of his own brand, Marc Jacobs. The new line features a Double-J logo feels fresh, young and modern; perfect for the Instagram generation. I’ve owned several kate spade new york bags through the years and they are always really nicely made with beautiful leather and detailing like black and white striped lining. The designs are classic but playful and functional, like this small harlyn crossbody bag with a fold-over closure ($228). An eclectic mix of bohemian glamour and American sportswear, the Tory Burch brand is known for being effortlessly stylish and elegant. Tory Buch’s logo medallion is the defining feature of many of these bags, which often have a Chanel-like vibe for a way more affordable price point. Rebecca Minkoff bags are on-trend and chic at an affordable price point. Rebecca Minkoff’s “downtown romantic”-themed handbags and accessories feature trademark leathers, studs and edgy hardware. The most popular statement-making Rebecca Minkoff bag styles (the M.A.C., pictured below, and the Love Crossbody) are available in a wide variety of colors, materials, and patterns. They often go on sale too! Ted Baker London has grown into a world-renowned brand offering contemporary accessories with feminine details. The company is known for its subtle humor, distinctive use of color and pattern, attention to detail, and, above all, its dedication to high-quality craftsmanship. Award-winning American designer Michael Kors creates luxury accessories with an innate sense of glamour and attention to detail. Their most popular handbag style is the Selma tote, but I’m loving this Mercer Crossbody ($248). Coach is a long time favorite in handbags, prized for their beautiful leather, American design, and New York “cool” vibes. First introduced in 1973, the Dinky, aka “the little bag that could” is a longtime Coach fan favorite. Thanks to its minimalist crossbody-to-clutch design, it’s crafted in smooth glove-tanned leather with a contrast lining. Yeah, I know everyone has one, but it’s with good reason. These easy breezy nylon totes are perfect for traveling. This favorite, water-resistant nylon tote is offered in a range of colors, trimmed with embossed leather for classic contrast. For $145, the Large Le Pliage tote is the ideal travel companion. Founded in 1976 in Munich, MCM is a brand that’s bold. MCM’s vision is to transform luxury fashion accessories by combining craftsmanship and value for today’s modern generation of global nomads: featuring a unique Monogram pattern that’s recognizable from anywhere. The Anya tote ($690) maintains it’s shape, the straps seem more durable, costs less, and not as common as LV. I hope you’ve come away from this post with something new on your wishlist, or at least something new to lust after. Let me know your thoughts in the comments.